Voters go to the polls to cast their midterm ballots at the Annunciation Greek Orthodox Church Cultural Center on Nov. 6 in Wauwatosa, Wis.
WUWM and the Milwaukee Journal Sentinel unpack the results of the midterm elections during a live Lake Effect show. Some races in Wisconsin's midterm elections were predictable, while others saw votes counted well into the morning. Tony Evers unseated two-term Republican Gov. Scott Walker in a neck and neck race, Tammy Baldwin retained her U.S. Senate seat and Paul Ryan's 1st Congressional Seat remains in Republican hands. 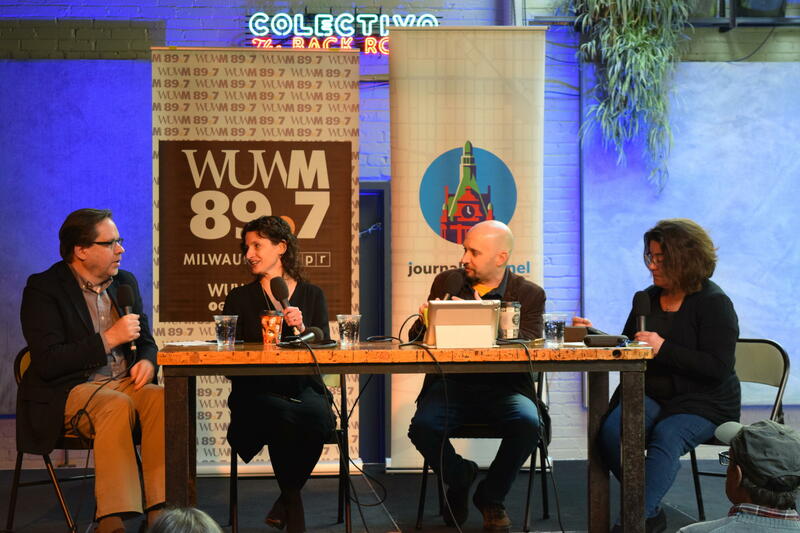 To conclude the Informed Voter series, Lake Effect and the Milwaukee Journal Sentinel hosted a live post-election show at The Back Room at Colectivo Coffee to discuss and analyze the results and ramifications. The governor’s race was neck and neck all night. But when it looked as though a recount was likely around midnight, it was reported that there were about 45,000 absentee ballots that were still uncounted. When a precinct has reported results, does that count the absentee ballots? Dan Bice, Journal Sentinel political watchdog columnist, says it seems like they count ballots throughout the day. This is the fourth time since 2000 that Wisconsin’s had a super close result, according to Craig Gilbert, the Journal Sentinel’s Washington bureau chief. “It’s not that novel. I mean, there was soap opera drama last night because of the timing of how the votes were counted, but this is who we are,” he says. Bice says people say Wisconsin is a purple state, but it’s not. (From left) Dan Bice and Mary Spicuzza of the Milwaukee Journal Sentinel with Lake Effect's Mitch Teich and Bonnie North. Mary Spicuzza, Journal Sentinel political reporter, says she saw a lot of questions about redistricting or gerrymandering concerns while live-tweeting on election night. Bill Glauber, Journal Sentinel general assignment reporter, says people don’t consider the fact that gerrymandering locks in seats for both the majority and the minority. “I don’t think people like politics or politicians that much, so for all of the incumbents to win, must say something about the system we have,” he says. So, what’s the path forward on new district maps? “It really comes down to if a Democratic governor and a Republican legislature decide that the way forward is paralysis and let the court do it. Or if the way forward is to compromise,” says Mordecai Lee, a political analyst from UW-Milwaukee and former state lawmaker. The Senate race was one of the first races to be called early into the election night results, with incumbent Tammy Baldwin winning 55 percent of the votes. Glauber says that this was no surprise considering Baldwin’s consistent and sustained campaigning. "Tammy Baldwin ran a relentlessly focused campaign, a very good campaign. She started early, got ahead of some events and really just put together what you would have to call a textbook campaign," he explains. Glauber notes that Republican challenger Leah Vukmir’s campaign lost steam far before election night. "She ended up emerging from that [difficult primary against Kevin Nicholson] around Aug. 15 — she did not have enough money to compete in the general election,” he says. “[Vukmir] raised about $5 million, Tammy Baldwin has raised more than $29 million, it will be $31 [million] when all is said and done. Money matters." The Marquette University Poll, which was famously off in the 2016 presidential election, was spot on in Wisconsin’s midterms — for both the gubernatorial and Senate races, Gilbert says. It was also right about the “roughly” equal numbers of Republican and Democratic voters. "Marquette hit that right ... The best polls are always going to be off some years ... but you can't do any better than [this recent poll]," he adds. Gilbert also notes it’s easier to poll in a state like Wisconsin where so many people vote. He says that voter turnout — at 60 percent — for Wisconsin’s midterm elections was “extraordinary”. “When everybody’s voting, it’s a little easier to try to capture everything that’s gonna happen on Election Day,” he says. Almost two weeks after the midterm elections, Wisconsin finally knows who its new attorney general will be. Republican incumbent Attorney General Brad Schimel conceded Monday to Democrat Josh Kaul. According to the AP, canvassed vote totals show Schimel lost by just over 17,000 votes. Even though Kaul's win was less than 1 percentage point and state law would allow a recount, Schimel said he wouldn't seek a recount.